Suneet Varma celebrated 30 glorious years in the fashion industry by concluding Amazon India Fashion Week with a stellar line of couture gowns and lehengas that had glamour written all over them. Titled ‘Garden of Eden’, the collection featured a range Indian silhouettes with contemporary elements, all made to suit a big fat Indian wedding. 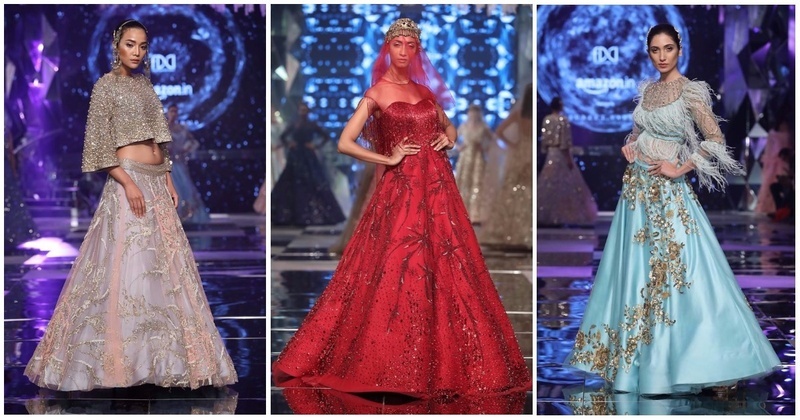 It was all about glitz, glamour and sensuality dolled up in sheer, lucid fabrics in a range of blues, red, pinks and silver. Click here for JJ Valaya’s New Collection Of Wedding Wear At Amazon India Fashion Week 2018.